Home » News » Appointment of new Harrisburg School Board member headed to county judge. 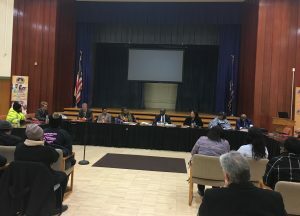 The next member of the Harrisburg school board will likely be chosen by a Dauphin County judge, as board directors tonight were once again unable to decide between two candidates vying for a vacant seat. Resuming a process that it tabled last week, the board split 4-4 on a decision tonight to appoint either Cornelius Chachere or Ralph Rodriguez to fill the seat formerly held by Melvin Wilson, who died unexpectedly last month. The board conducted two rounds of voting tonight, but the results both times were the same. Board directors Carrie Fowler, Brian Carter, Judd Pittman and Ellis Roy supported Chachere, a non-profit professional and former substitute teacher at Sci-Tech High School. Board president Danielle Robinson, vice president Lola Lawson and directors Patricia Whitehead-Myers and Lionel Gonzalez voted for Rodriguez, a Harrisburg High School graduate and father of five. Pennsylvania School Code states that vacant seats must be filled by a majority vote among remaining members of a school board. Since eight members remain after Wilson’s death, a new candidate needs five votes to secure a seat. State law gives the board 30 days to fill a vacancy. Wilson died on Dec. 16, and Chachere and Rodriguez first appeared before the board on Jan. 16 to declare their candidacies and sit for interviews. But with Gonzalez absent from the appointment meeting, only seven members were present to cast votes. The board split 4-3 in favor of Chachere, with Robinson, Whitehead-Myers and Lawson in the minority. Even though he got support from the majority of voting members, Chachere still needed five votes to take the seat, said school solicitor Samuel Cooper. Cooper reaffirmed his reading of School Code tonight, and said that the Pennsylvania School Board Association agreed with his judgement. The board tabled the decision last week and put it on the agenda for this week’s regular meeting. But since neither candidate got the necessary five votes tonight, district residents have the power to petition the Court of Common Pleas to fill the seat. Section 315 of Pennsylvania School Code says that, if the board has not filled a vacancy in 30 days, 10 residents can petition the court to fill the seat with “a suitable person” who lives in the district. Cooper said tonight that residents can submit any candidate on their petition, including those who did not appear before the board to apply for the seat. After the board reached another impasse tonight, Robinson proposed re-opening the field to applicants, in hopes of finding one a majority of the board could support. But her colleagues voted 5-3 in an informal vote against Robinson’s proposal. Based on the process outlined in School Code, however, it’s unclear whether the board could have forestalled a court appointment, given the time that has elapsed since Wilson’s death. Kia Hansard, a founding member of the citizen-led school reform group CATCH (Concerned About the Children of Harrisburg) said tonight that she and other citizens plan to petition the court to appoint Chachere. She said she can easily muster the 10 signatures required by state law. Next Post Mayor seeks new contract, broader goals for 2019 lobbying efforts.